Jennifer Psaki, the spokesperson for the U.S. Department of State announced today (in video above) that the United States will continue to supply Egypt with $1.5 Billion of annual aid despite section 508 of the Foreign Assistant Act, which states: "None of the funds appropriated or otherwise made available pursuant to this Act shall be obligated or expended to finance directly any assistance to any country whose duly elected head of government is deposed by military coup or decree." Given the fact that Mohamed Morsi, the first freely elected President of Egypt, was ousted in a coup d'état on 3 July 2013, Ms. Psaki would naturally expect some resistance to the Administration's stance. A particular body language signal that Ms. Psaki uses in this press conference should be strongly avoided in all but the rarest of times - the mid or lower held Pseudo-Prayer (when held higher, particularly over the mouth it has a completely different meaning). Displayed several times in the final quarter of this video, the pseudo-prayer is strongly patronizing and self-righteous. Outside the setting of a kindergarten class room, a religious setting, or a higher held example (see above and below cross references) and a few culture-specific scenarios the pseudo-prayer is a body language gesture which should not be used unless one's goal is to destroy rapport and send signals of blatant arrogance. These emotions are amplified when an up-and-down chopping motion is added (seen briefly here at the 1:29 mark). Close your eyes and listen to this video after you have watched it once. Pay close attention to Ms. Psaki's tone of voice. How would you characterize it? Is her tone, volume, cadence and staccato rhythm congruent with her nonverbal signals? It is rumored that Ms. Psaki is being groomed to replace Jay Carney as The White House Press Secretary. Her body language and paralanguage is strongly suggestive that such a promotion or a lucrative private sector position will come is in her near-future. 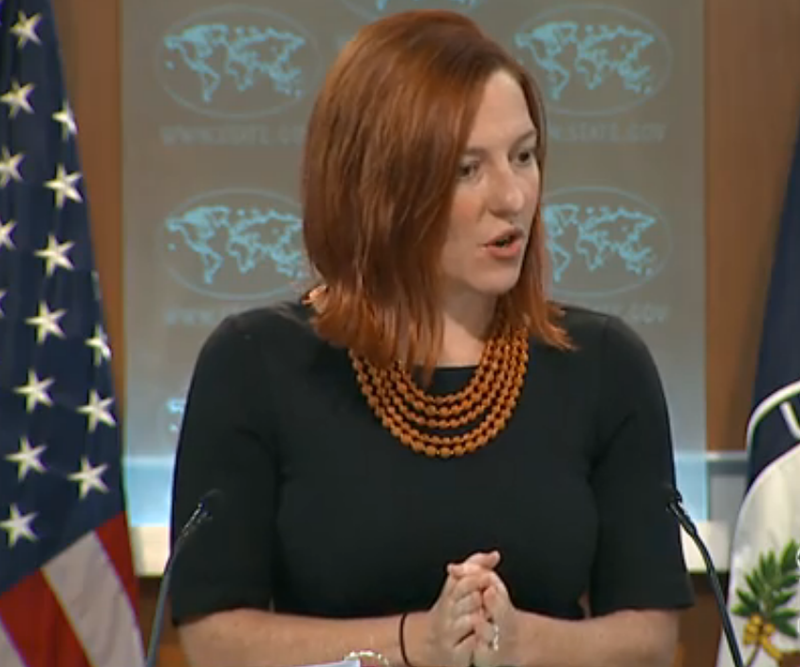 What other body language faux pas does Jen Psaki display? What nonverbals did she use to her advantage?